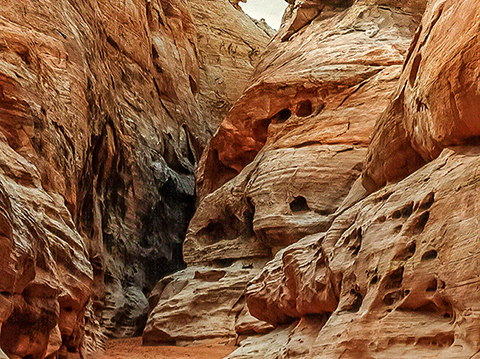 Dedicated in 1935, Valley of Fire is Nevada's oldest and largest state park. 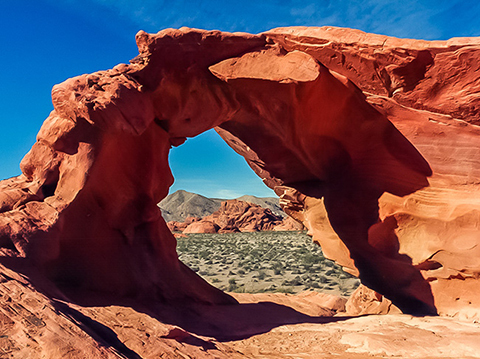 The valley derives its name from the vibrant red sandstone formations and the stark beauty of the Mojave Desert. Ancient trees and early man are represented throughout the park by areas of petrified wood and 3,000 year old Indian petroglyphs. 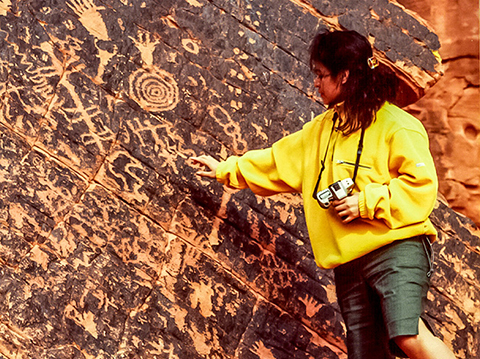 The Atlatl Rock was named because many petroglyphs on the rock depicts these weapons. The ancient Indians used an atlatl to launch their spears. It had a short cord wound around the spear so when thrown into the air the spear would rotate. This area has outstanding petroglyphs. This arch rock resembles the look of an elephant, therefore is named Elephant Rock. The wind and water weathering elements have erroded the rock creating many folds and breaks. The erosion has, also, worn away top layers fully exposing sharp angled rocks that created Fire Canyon. In the 1890's a Southern Paiute Indian renegade, called Little Mouse, hid after being accused of killing two prospectors. The natural water basin became known as Little Mouse's water hence the name Mouse Tank. Rainbow Vista viewpoint reveals a vast area of multi-colored rocks stretching for miles. This panoramic view is a great place to take pictures. The tour operates with groups of 8-29 passengers. Exclusive pick-up and drop off in your luxury VIP chariot. If you are not picked up within five minutes of your pick-up time, do not wait. Please CALL US IMMEDIATELY. 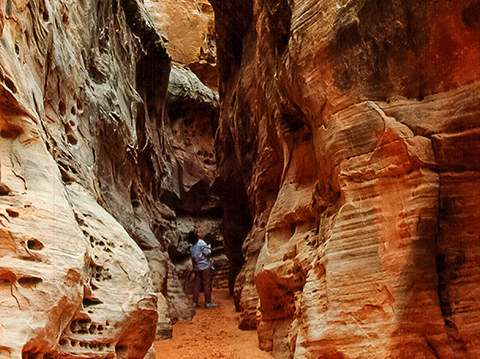 Walk among beautiful rocks and drive through a country that seems to be on another planet.